Fnatic Dota: Ahjit Joins the Roster! Fnatic Dota’s been making a steady improvement since the new roster came together back in April, but it’s been pretty clear we haven’t meshed as well as we wanted. Meracle is a player with immense talent, but in the last few weeks we’ve seen just how different his style of play is compared with the rest of the roster. We’ve been exploring alternative options and as a result we’ve brought in former Warriors Gaming.Unity Carry, AhJit to bolster our offense at #1! Known for some SUPER aggressive play, the young Malaysian will be bringing some much needed cutting edge to the fray, while the rest of the team continue to sharpen their synergy. Meracle will move to the sub position but continue to help the boys develop into the calibre of squad fans want to see. You’ll be able to check out our new Carry on May 20th! 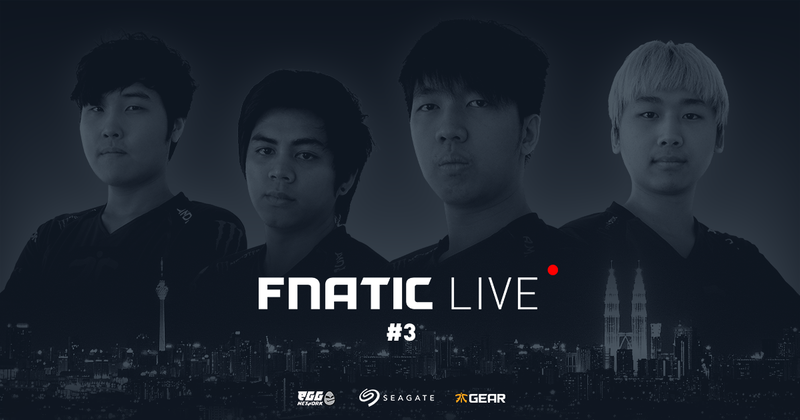 We’ll be live with the team in Kuala Lumpur for Fnatic Live #3, with our good friend pindaPanda coming in to host our first show in South East Asia. If you’re in the area, we’d love to see you, so if you want to hang out with us, meet pinda and the team, sign up here and join us for the night! We’ll be holding a Q & A with the boys on air, so send us any questions you’ve got using #fnaticlive, and we’ll get them answered on the show! So, for a killer night of Dota, tune in this Saturday, 9pm (MYT). We’ll see you there!